So I’m sitting here at my day job, working away, when I got an email notification that someone bought something at the Zazzle Store…upon checking out the order history it seems someone just bought 12 bumperstickers! Whoever you are, the Admiral and I thank you! UPDATE: Sold 2 of the “old school” Adama stickers just now too! Keep ’em coming and I can pay off my trip to ComicCon! Our First Challenge for Adama Precinct Captains: The Poster Challenge! The Adama campaign has its first challenge for patriotic Colonial citizens : our Poster Challenge! As we’ve announced on our Facebook Group, the goal is to get the word out about Our Candidate by posting our Adama for President posters in public. Once you’ve printed out some posters and posted ’em somewhere interesting or cool, take some pictures and email a jpeg to us (and post on Flickr too, if you can). The person(s) who submit the coolest photo (as determined by me) win a free Adama shirt and sticker. As always, exercise common sense and good judgment – don’t vandalize private property, and don’t do things that can get you arrested. Do, however find public spaces or bulletin boards, or your office cubicle, or wherever, and have fun! I look forward to your submissions! Did You Buy A Shirt? A Sticker? Or Print a Poster? If So, Take a Picture and Send It In! Well it’s been a heck of a day around here, what with the Jamie Bamber news and of course, the midseason finale of Battlestar Galactica, which was on SciFi.com all morning, and will be on later tonight! But after an email discussion with one of our Loyal Supporters, we’re now asking those of you who’ve bought a shirt, a bumper sticker, or printed out one of our posters, to take a snapshot of yourself in said apparel (or sticker on your car, bike, etc) and post it to Flickr, or just email us a copy, and we’ll post it on the site! Hey, now that BSG is on hiatus, we gotta do something fun this summer, right? The Eagle Has Landed: Our Care Package Arrived in Vancouver BC! UPDATED!!!!! Allow me to break character for a moment and share some fun news: last week I made up a care package of Adama for President shirts and stickers and, with a little help from ProgGrrl at Galactica SitRep made arrangements to ship directly to the studio in Vancouver, where they’re filming the last episodes, ever, this week. I also shipped some stuff to Logan, who attended the LA Times screening at the Arclight yesterday. Normally, I would not nerd out like this, but strange things can happen when fans start talking. Hopefully, the cast will enjoy the care package and maybe we’ll see a few pics with the cast and our apparel and stickers! Kelli sent you a message. “Ask” Admiral Adama A Question…Any Question! The Colonial patriots over at Galactica Sitrep alerted us to this Adama Oracle, where you can “ask” Admiral Adama a question on any topic, and he’ll answer. Definitely easier than trying to ask “real” candidates a question, and way more entertaining than the Magic 8-Ball! Check it out! Hey! We’re on Facebook Now Too! I went ahead and made a Facebook group so if you’re on Facebook, join the group and tell your friends! We may have some more items, including hats and stickers soon! Stay tuned! New Shirts and Bumper Stickers for Sale Today! Today we’re rolling out two new products – a new shirt and a new bumper sticker – which include Version 2.0 of our Adama for President logo! Go to our Zazzle online store and order one today! Special thanks go to the talented designer who helped me convert the Obama logos – Ellen Sherrod of San Francisco, CA! Thanks for the help, Ellen! Post a Picture of YOUR Adama For President Poster on Flickr! As you know, you can either download this small file for your very own copy of our Adama for President Poster, or buy a copy via ImageKind. 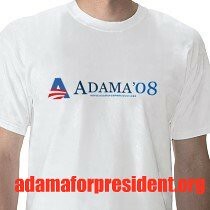 Now, we’re asking people who do print up a pic, as this Flickr user did here, to take a picture of where you’ve posted your Adama for President poster and either send it to us here at the blog or post it to Flickr and add the tag “adamaforpresident.org” (all one word). If you see other blogs or websites that feature our poster design, let us know and we’ll link to ’em! We’ve already made our presence known at the University of Michigan campus – let’s see where else these end up!